We like to think of Teton Springs Lodge & Spa as Jackson Hole’s quiet neighbor—peaceful and independent from the noise, but with its own variety of equally exciting, western adventure. Here you can explore the Big Hole Mountains on horseback, discover nearby trails, and, of course, enjoy the amazing onsite amenities. Next, satisfy your inner angler at South Fork Lodge, where fly-fishing on the Snake River is second to none. Our expert guides will work with you, no matter your skill level, to ensure that you have the best fishing trip of your life. A great vacation for groups of friends and families alike, your week in Idaho will be one you’ll never forget. Stop for a cold one before you arrive in Teton Valley. Most flights arrive in the afternoon, so you have a crystal clear view of the amazing Tetons as you fly in. Stop in for a tour or a round of drinks at Grand Teton Brewery and sample their famous handcrafted brews. Check in at the lodge and relax in your private accommodation. You’ll need to be well rested for all the adventure ahead! Discover the natural wonders of Teton Valley. Take the ferry across the beautiful Jenny Lake and challenge yourselves with a rewarding hike up to Inspiration Point before trekking your way back around the lake. Make the 5 mile, 1,000 foot vertical drive up Signal Mountain where you will soak up panoramic views of the Tetons. 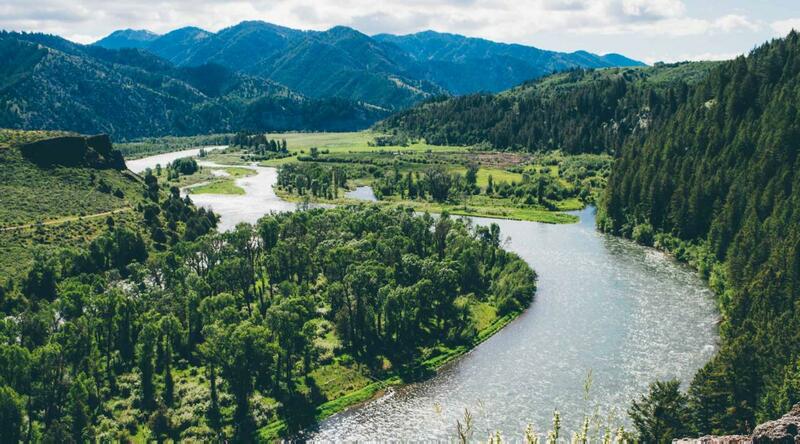 On the other side you will admire the Snake River – you will be fishing those waters soon enough! When you get back to the lodge, dine at this exquisite onsite restaurant overlooking the golf course. Sample the golf course and heated pool, with a barbeque break in between. Take to the green at Headwaters Golf Course, which can be played on 9 holes or 18. The course, designed by collaborating PGA pros and renowned architects, is an accomplished blend of nature and strategic planning. Best of all, premium tee times are reserved for guests of the lodge. Do you smell that? That’s the best barbeque in town – be sure to bring your appetites! Spend a relaxing afternoon at our heated pool, one of the largest in the region. Transition from Teton Valley to Swan Valley and trek through the scenic trails in the area. Take the parkway over the mountain—an absolutely gorgeous drive. You can arrive before noon even if you decide to sleep in. Get to know the South Fork area by hiking one of our favorites, a 4-6 mile trail to Palisades Lake. Bring your rod if you want—the creek is teaming with native cutthroat trout and is fishable starting in July. Tasty local ingredients on a seasonal menu at our onsite restaurant. Fish the upper section with your guide and see some area favorites. Begin the day at Palisades Dam and float past the mouth of the Palisades Creek. You’ll pass the iconic Fall Creek Falls, where you can pose for a killer photo op with your prize cutthroat and the waterfalls in the background. Sip a drink on the outdoor patio at the Riverside Bar & Grill and soak in the surrounding scenery. Begin your trip through the wild and scenic Canyon Section. You and your guide will put at the Conant boat ramp before traveling through section 2 of the river. This section will take you into the Upper Section, which is known for housing large populations of native cutthroat. Stay in our luxury overnight camp, where drinks and appetizers will be waiting for you along with your luggage. Many of our guests have caught trophy trout right on the shore of the camp! Conclude your trip on the lower section of the South Fork, and drink in the epic views as the sun sets over the river. Wake up next to the rush of the Snake River and set off for the lower canyon with your guide. This section is home to big brown trout that reside in the sunken cottonwood trees. Be sure to keep an eye out for one of the 19 active bald eagle couples that call the South Fork of the Snake River Home. Once you’ve returned to the lodge, toast to your memorable week spent in the beauty of Idaho. "My happy place is South Fork Lodge. The fishing is top notch and the atmosphere at the lodge in the evenings can't be beat." South Fork Lodge on the Snake River is a truly remarkable place. Imagine big, open skies, incredible sunrises, sheer rock cliffs, and some of the best fly fishing in the United States – right at your doorstep. Stephen spent the past summer at the South Fork Lodge with his dog and best friend Bert –he truly cherishes this unique fishing haven. Stephen prides himself in living a life of adventure, and some of his passions are the outdoors, fellowship, and fly-fishing. He is excited to help you 'Live the Dream'!